It’s been a few days since I’ve completed Playdead’s “INSIDE” and I still find it difficult not to aggressively sell the game like I’m getting paid commission. “INSIDE”, while not a complete surprise like its predecessor “Limbo”, nearly came out of nowhere, with a only two trailers shown over the last 6 years of development. The anticipation has been real, but not with the usual pre-release hype of potential GOTY (game of the year) contenders, e.g., Uncharted 4 or Dark Souls 3. So the biggest surprise is not that “INSIDE” exceeds its precursor in every way, but that as a game “INSIDE” stands up to and above many of this year’s AAA heavyweights—games with budgets in the 100s of millions and teams 100s of times larger. It’s almost impossible to imagine another game coming around with such accessibility (the simple controls guarantee almost anyone can play this game), heavily polished style, superb sound design (macabre fact: music was made with synthesizers running through a human skull), and polished gameplay. “INSIDE” is truly an amalgam of small innovations in design, atmosphere, and aesthetics that add up to an inspired experience. The game still operates as a 2D side-scroller a la Super Mario Bros, but Playdead has blown out the depth with a stunning 2.5D presentation. The results make almost every frame a living painting. Lighting, sound, and game-feel only further compound the sense of unique atmosphere the visuals create. The powerful aesthetics alone would be enough for some developers, but Playdead brings the same level of handcrafted care to the puzzle design. We’ve played through many of the baseline mechanics that make up “INSIDE’s” dystopian misadventure. The puzzle DNA of Mario, Oddworld, Zelda, and others can be seen swimming through “INSIDE’s” design, but Playdead reimagines these puzzles and pushes them into new experiences for the player. Singular puzzles are no huge innovation alone, but the subtle twists, variety, and polished singularity adds up to a refreshing sum. Playdead uses puzzles like symbols in literature: re-contextualizing what we know to evolve and expand our understanding. “INSIDE” is so confident in these puzzles that it only sits on some concepts (that could power full games) just long enough to create some “aha!” moments. There’s a restraint that makes the 6 years of development justified. The puzzles move along with the pacing of the narrative, covering stealth, action, and environmental traversal. The conundrums don’t waste your time (you’ll solve them pretty quickly), but the solutions are not always immediately clear. There’s a rhythm to trial and error that seems as calculated as all the other elements of the game. These puzzles at times are elevated beyond a logic exercise to a playable metaphor. This is exemplified through one of the core puzzle mechanics, which when introduced is simultaneously horrifying and awe-inspiring. This mechanic evolves both practically and symbolically in surprising ways. I’d go as far as to say there’s nuance, something analogous to character development, in the puzzle design. Speaking of character development, all the component of “INSIDE’s” narrative have come together in a way that is more emotionally affective and polished than Limbo. 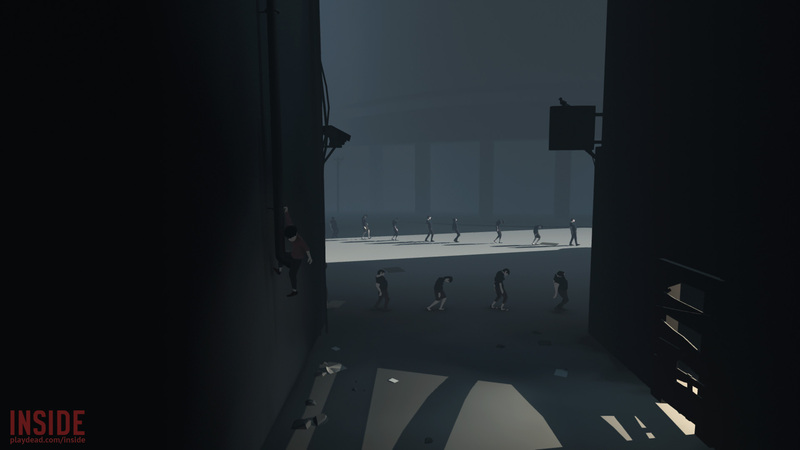 “INSIDE” still overflows with Playdead’s trademark ambiguity, but there is a ton of world building, character, and symbolism to chew on. The world itself feels and appears lived in—rife with culture, industry, and the mysterious people of a dystopian society. The metaphors are many and inscrutable in the way of difficult poems. And reading the game as a poem, may be the best way to find satisfaction in its opaqueness—knowing that there are no clear cut answers but rich narrative soil for interpretation. Although there are clearer hints and a conclusive ending this time around. What struck me the most was how the ambiguity of motivations in the game brought its characters and world to life with genuine human intrigue. How did this boy get here? What are his motivations? What’s up with this dystopian society? Who are these people? Why are they doing what they’re doing? It’s not that there are no answers whatsoever, but the fluidity of those answers are trapped behind the interiority of another in a very human way. Yet the game never consumes itself with pretentiousness or didactic allegory. The game certainly has things to say, but like its gameplay “INSIDE” wants you to test and ponder a bit before coming to a conclusion. I could keep going about the must-play merits of “INSIDE”, but I suppose that would go against the spirit of a game that does not overstay it’s welcome. The TL:DR version of this review is as follows. What makes “INSIDE” worth playing is how well Playdead crafts light, sound, narrative, and interactivity into an adventure that infiltrates your mind and stays there long after the credits roll.